First off, allow me to don my best Canadian accent and then continue to speak like an American as I discuss Essex County by Jeff Lemire. You’ll see why I say Canadian here in a second. For those of you unfamiliar with Essex County, yes, it is a real place; not just in our hearts and minds, but in lovely rural Ontario, Canada. Not be confused with Essex County, Massachusetts or New Jersey, but beautiful Canada. I Google Earthed it, and from a Google car it is very serene. I’ve been on a Jeff Lemire kick as of late and I’ll tell you why. He is a rising Canadian star and has been such for a while. Affectionately called the “Favored Son of Essex County” (where he grew up), he is a multi-award winning writer and cartoonist. Currently, he is writing for DC Comics on not one title, not two, but oftentimes three books at once! His writing is just pure choice. 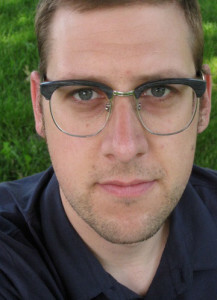 This is Jeff Lemire’s face. I discovered Lemire via Animal Man, a comic book that is well known for its dark existential moments and comedic lightheartedness once penned by industry giant, Grant Morrison. As of this writing, Lemire is also writing for Sweet Tooth, Justice League Dark, and the new Kid Eternity, while Animal Man issue #1 is on its 6th or 7th reprint. Now, I don’t know about you, but when someone consistently wows me with story elements and style I not only pay attention, I get obsessive. It’s bad. I have to learn everything about this person and read or watch all their prior work because I fear that one day my life may depend on such trivial knowledge. I want to see their patterns, know their tropes, get familiar with their style. If someone pulls a gun on me and says, “Tell me which themes Neil Gaiman uses the most” or “What school did Joss Whedon graduate from and what was his first TV gig?” I could answer those questions and spare my own life. And this has happened with Lemire. From the first issue of Animal Man he had me hooked. With every forthcoming issue I continued to be impressed. So, I said to myself that I had to go back and read what he was doing before this. His back catalogue isn’t that extensive, so it was easy to catch up. But the gem in his works has to be Essex County, published and collected by Top Shelf Productions. Essex County, the collected version, clocks in at 489 pages (510 pages if you include the extras) and roughly weighs lesser than a half-gallon of milk. That alone ought to let people know that it’s not just a collection of funny books, but something to be taken seriously. It is a trilogy of stories set over generations in, as previously mentioned, Essex County, Ontario from 1917 to the late 1990’s. Lemire not only writes these stories, he draws the stories in thick black and white ink strokes reminiscent of Eddie Campbell, Jose Munoz, and Paul Pope. And no, there are no super heroes in this book. Well, not in the way that you would think. I know that might be a turn-off for some people, but stick with me here. So, my library has these, so that means I will have to read them. I’m there twice a week for various reasons, so I tend to get everything from the library, at least at first (and if I like, I buy). I’ve been in the mood for something different lately, and this looks like it might hit the spot.